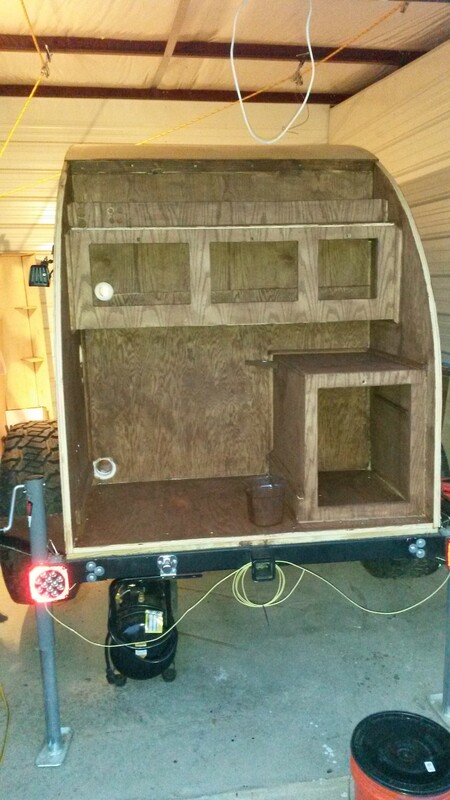 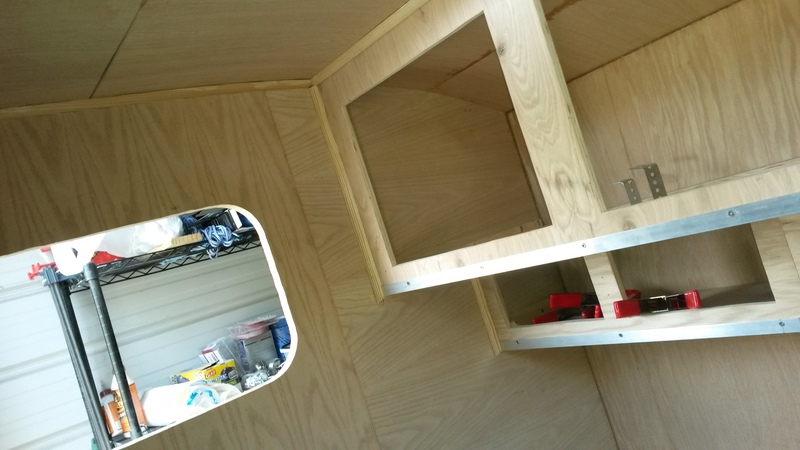 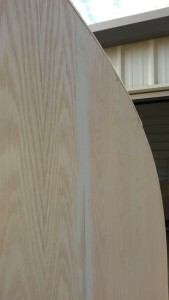 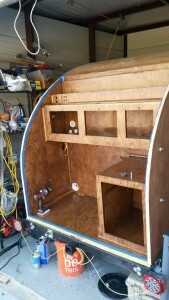 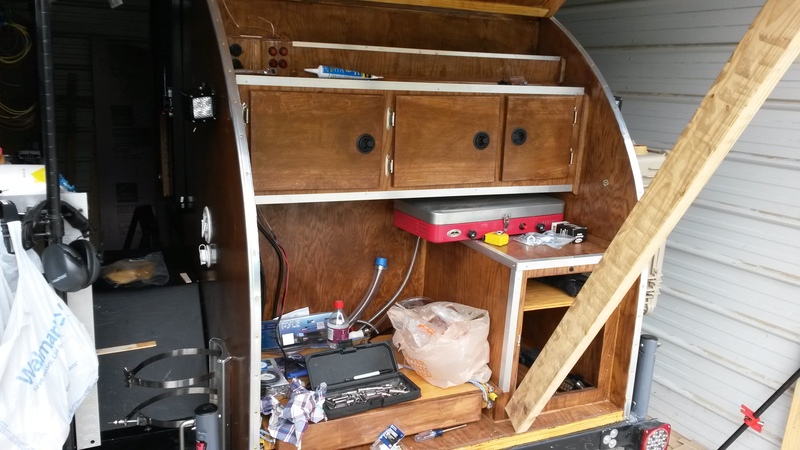 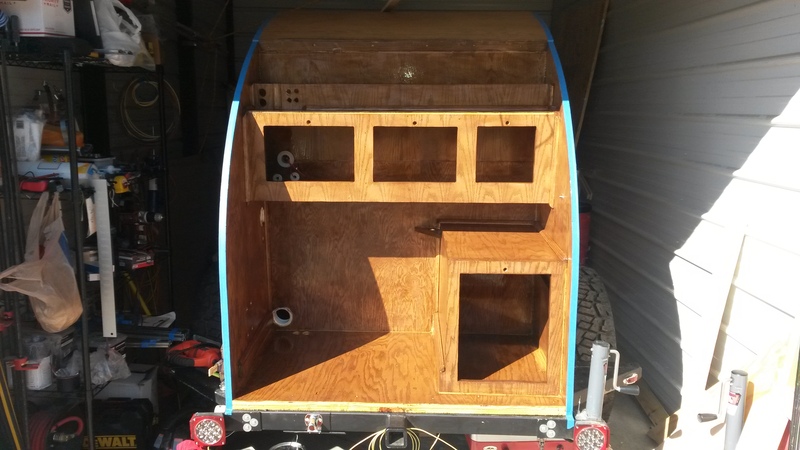 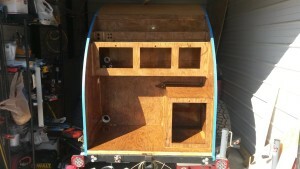 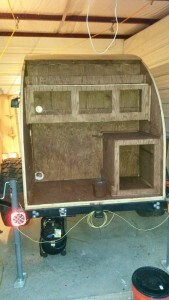 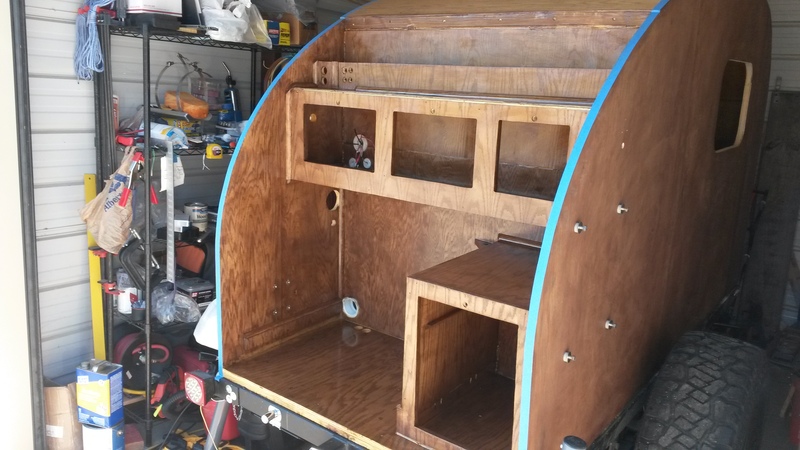 In this section I will talking about all the finishing work I did on my tear drop camper. 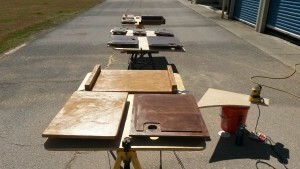 This will mainly include the sand, epoxy, and varnish. 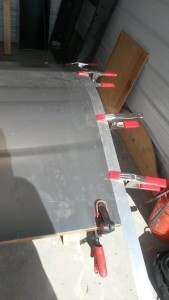 Then a little trim and aluminum sheet work. While mounting up the exterior panels and roof panels. not everything turned out picture perfect. 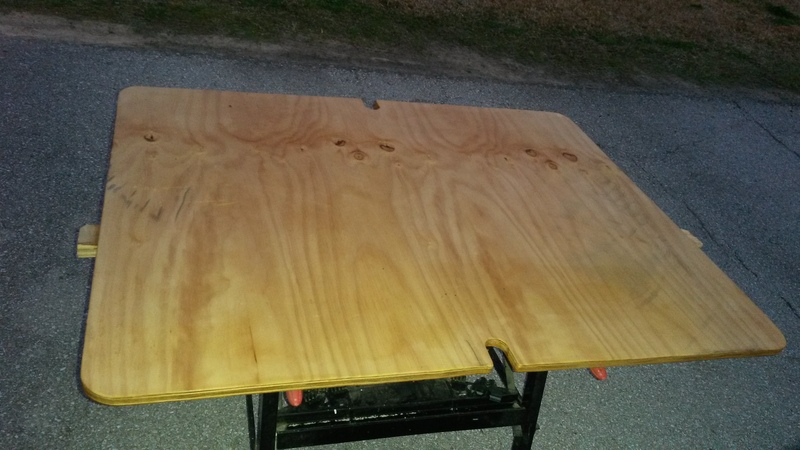 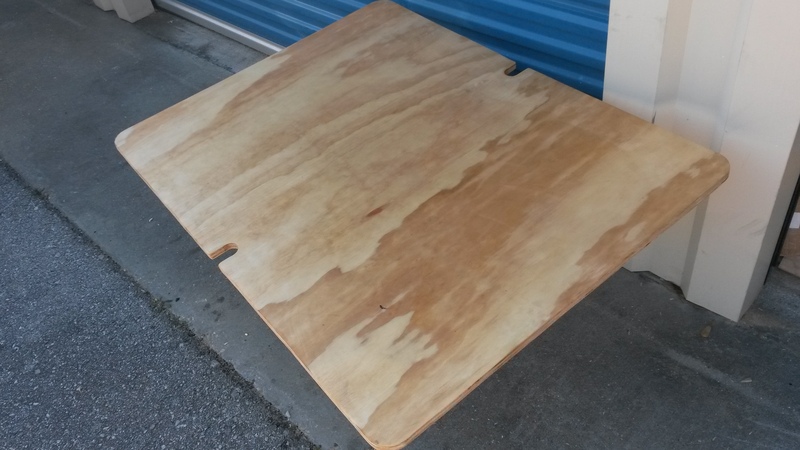 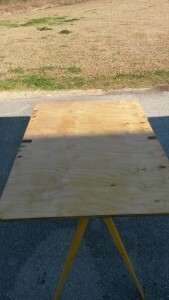 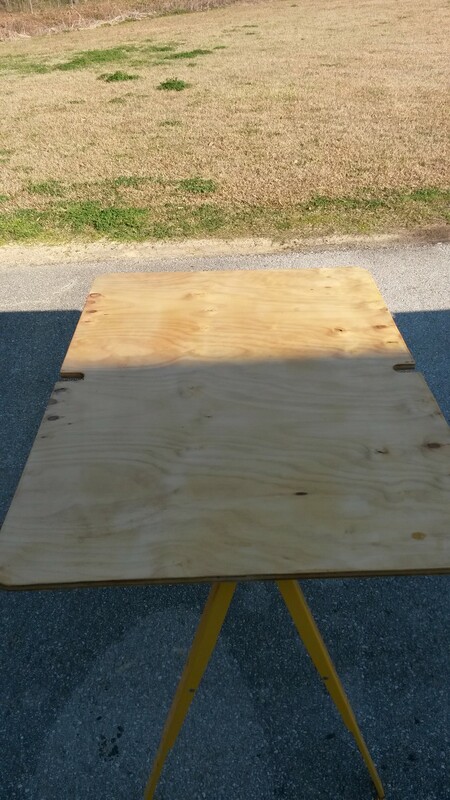 So I got some stain able wood fill and leveled out the uneven surfaces and filed in the cracks. 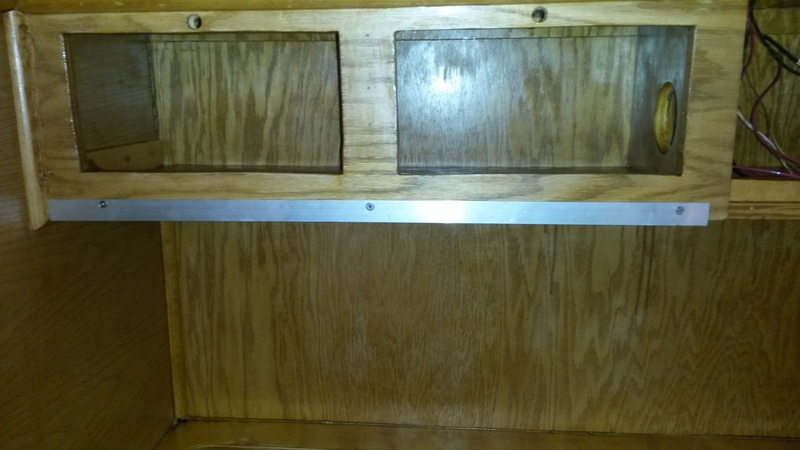 I have to say I hated the look at first. 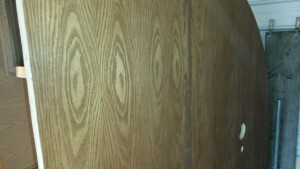 But now I kinda like it. 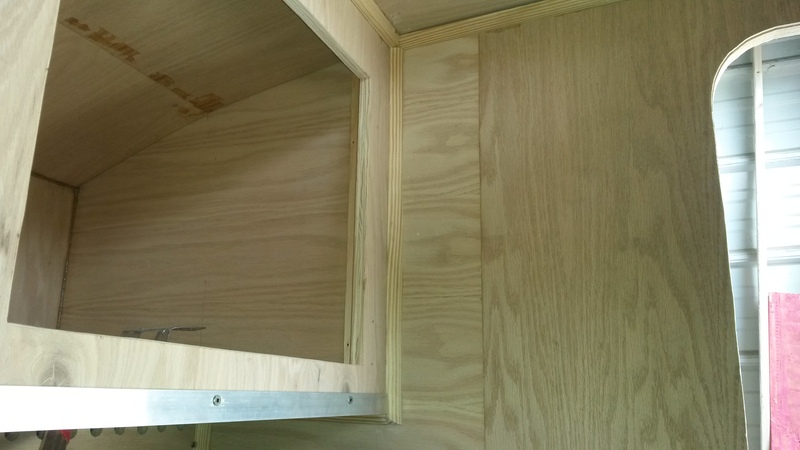 it breaks up the sides. I then sanded down the filler to smooth everything out and leave as little filler as possible. 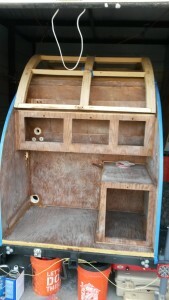 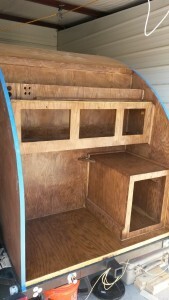 I then started mounting all the quarter round and flat trim on the inside and galley to make all the corners look pretty. 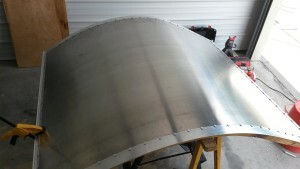 Along with this I decided to go with aluminum angle iron on the exterior corners as these are bound to get bumped and hit more and the aluminum would hold up better then wood. 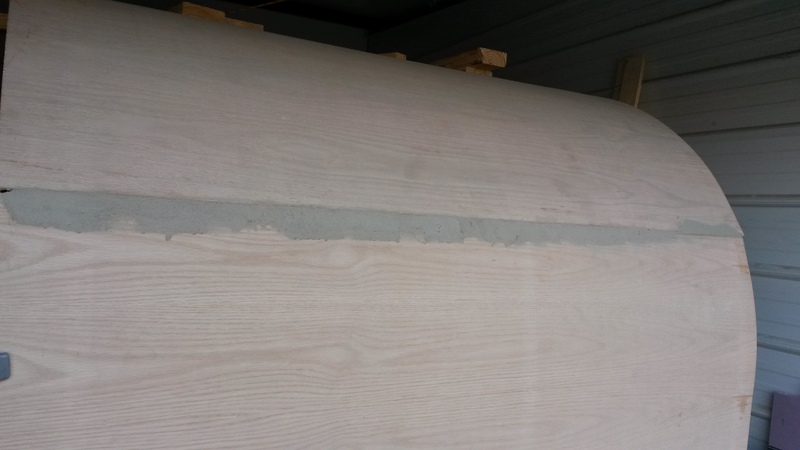 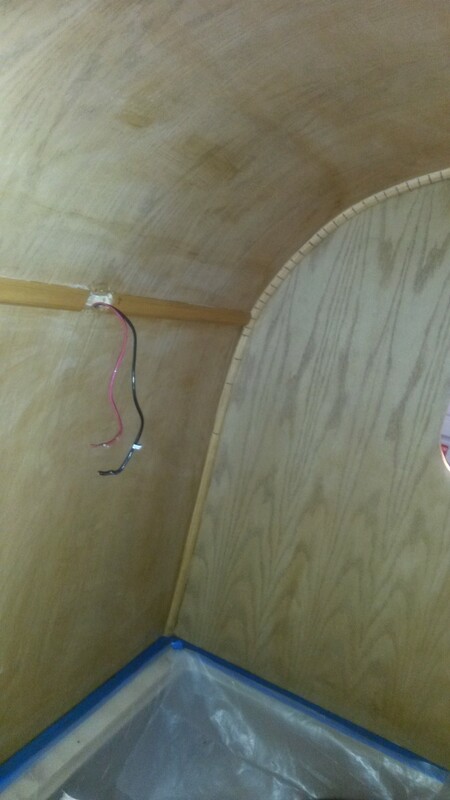 This is one job I wish I could redue on the trailer but once it is glued up it is extremly difficult to remove so I decided to leave it and not risk damaging any of the walls or ceilings. 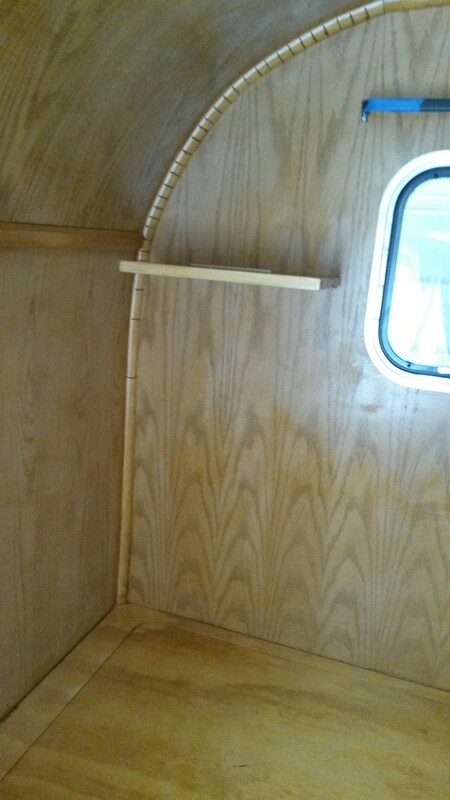 But it was very difficult to get the corner round to stay sitting flush against the ceiling while drying so there are some gaps here and there and I have yet to figure out a good way to fill them in. 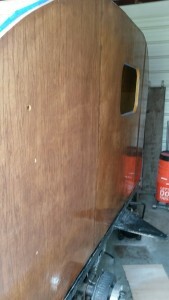 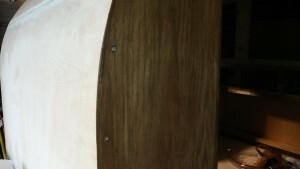 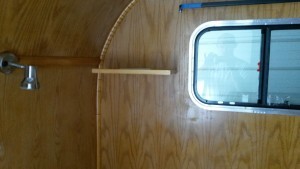 Next I very lightly sanded and clean the exterior of the teardrop. 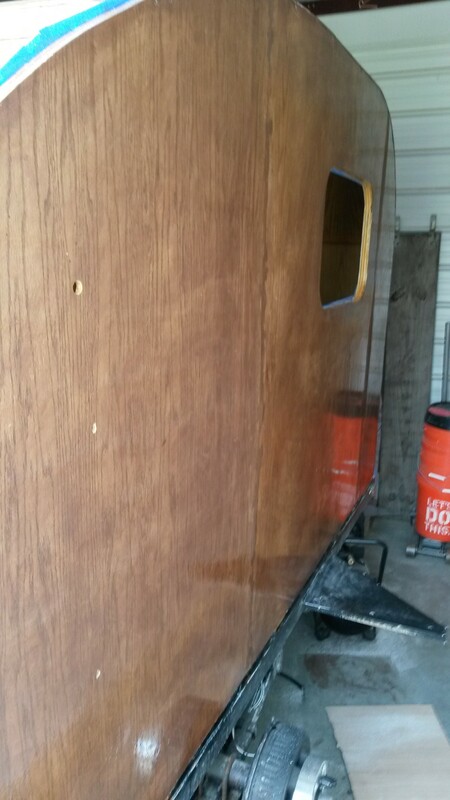 I then stained the outside with a nice dark rich stain. 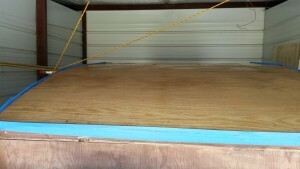 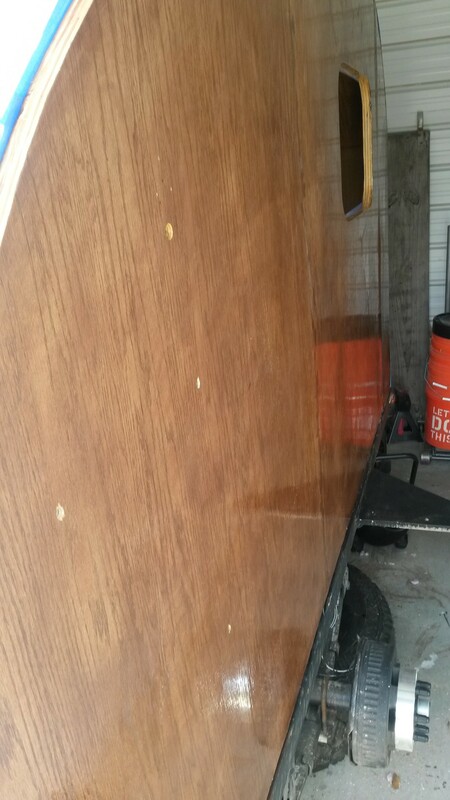 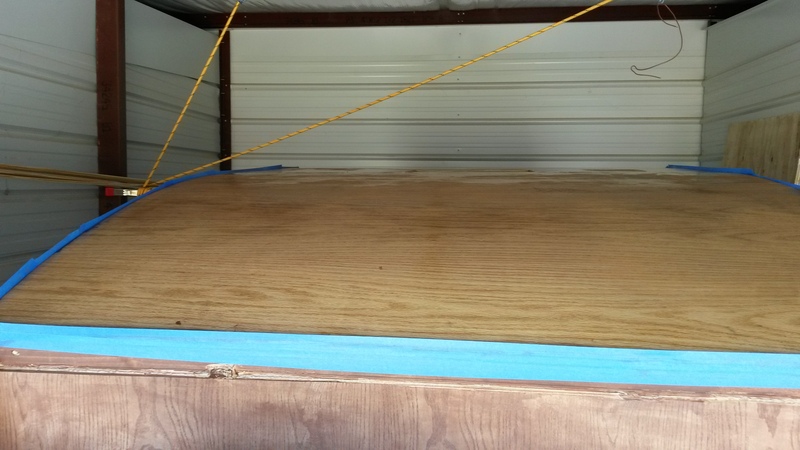 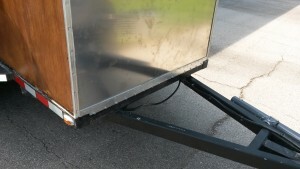 I choice a darker color to help hide dirt and other things as the trailer will not be spotless everyday. 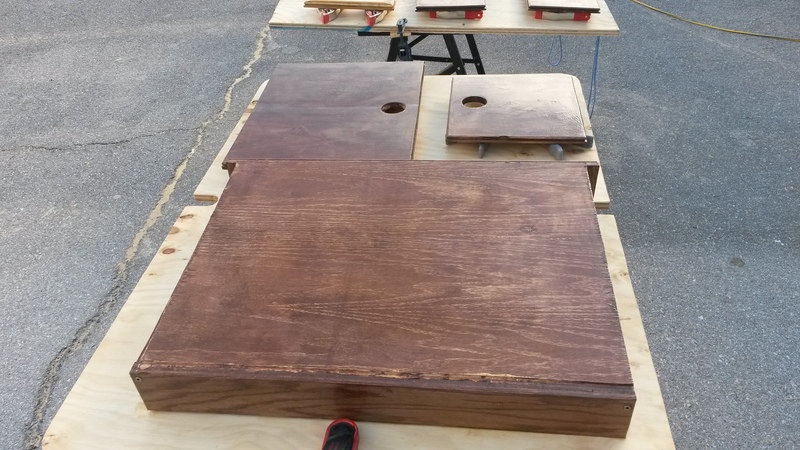 I also used a water base stain for the first time and learned a lot. 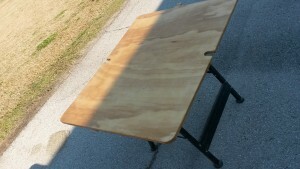 It as a cool humid day when I did the work and the stain dries incredibly fast. 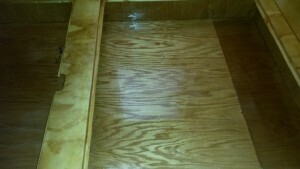 You have about 15-20 seconds to apply the stain and wipe it off. So do small sections at a time. I went with the water base stain since there are reports of epoxy and other finishes not sticking to oil base stain as well and you will need to let the oil base dry 50x longer to prevent this from happening. 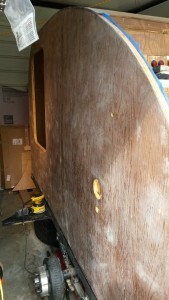 While letting the exterior fully dry. I decided to stain all the cabinet doors with the darker stain also. 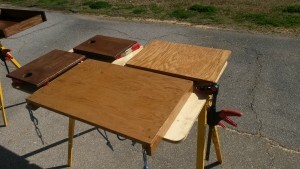 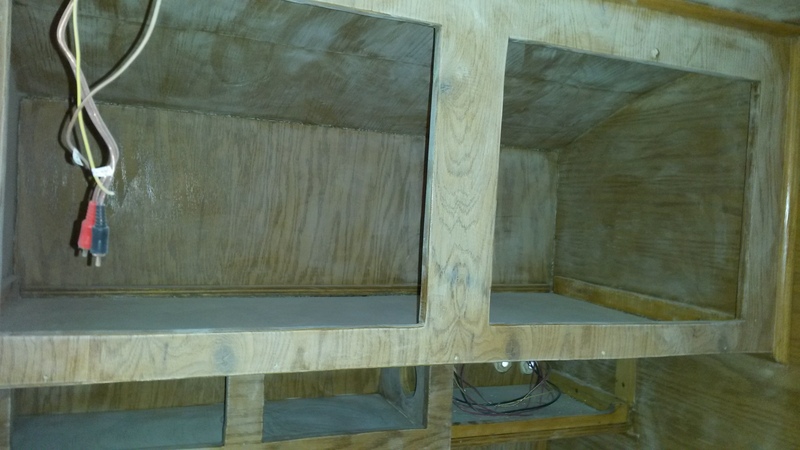 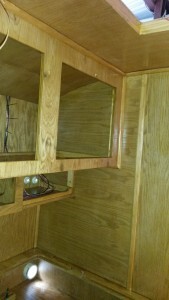 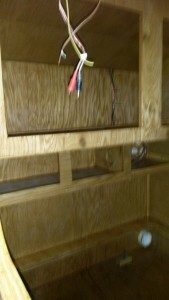 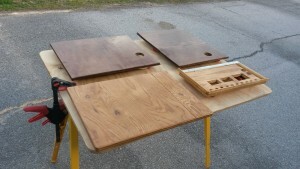 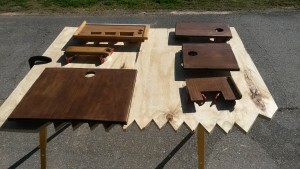 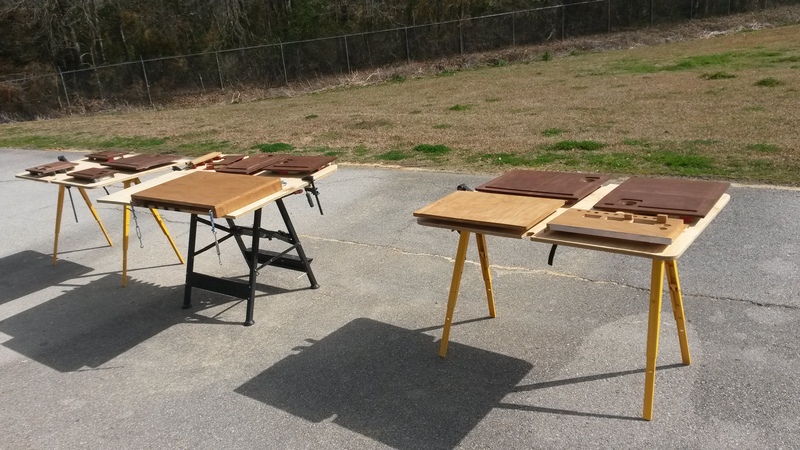 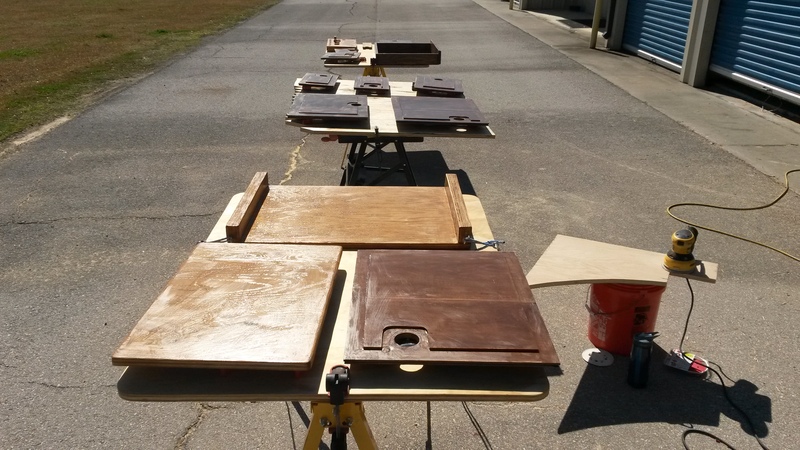 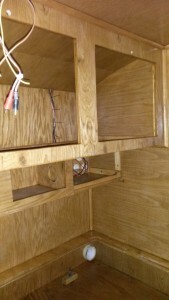 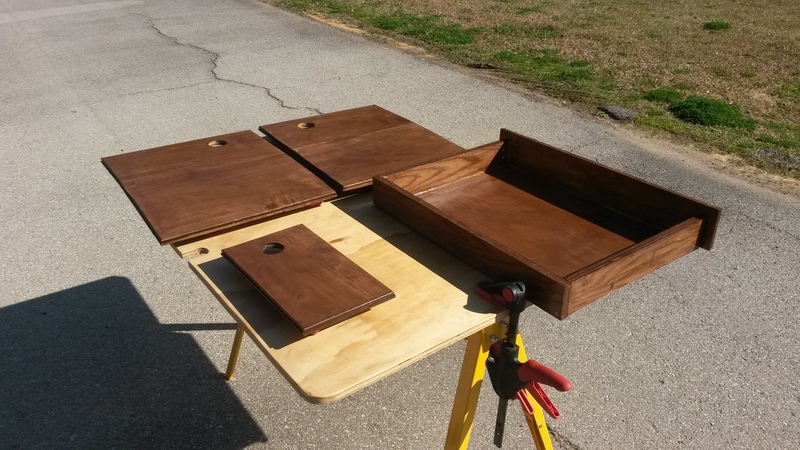 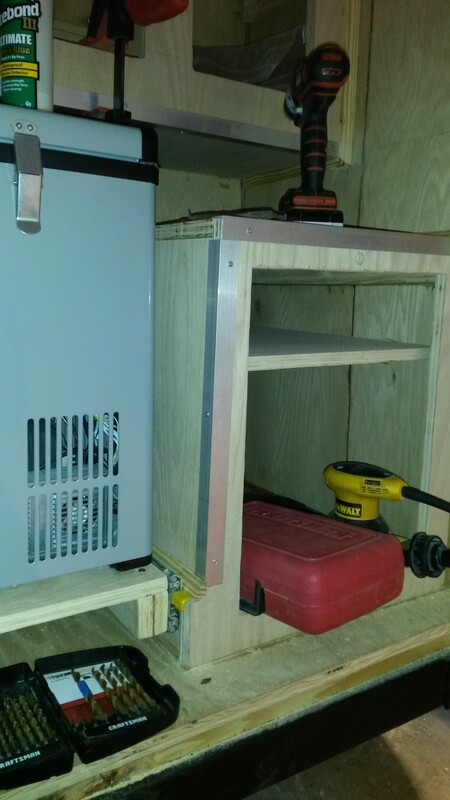 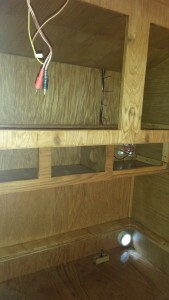 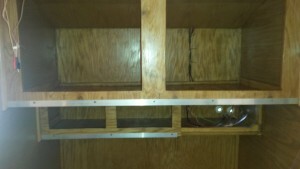 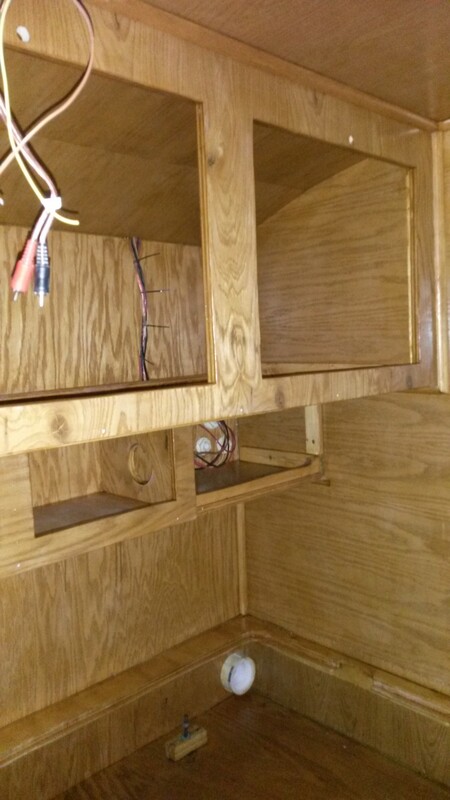 I then went ahead and stained all the electrical doors and cabinet shelf with the stain that will match the area. 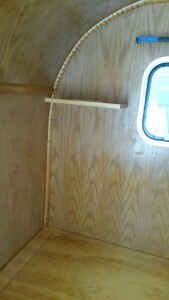 I taped off the floor on the inside of the tear drop as I was not going to stain this section. 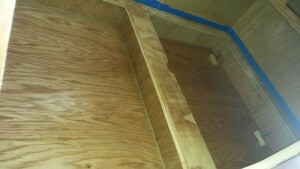 as it will be hidden by the sub floor and the bed. 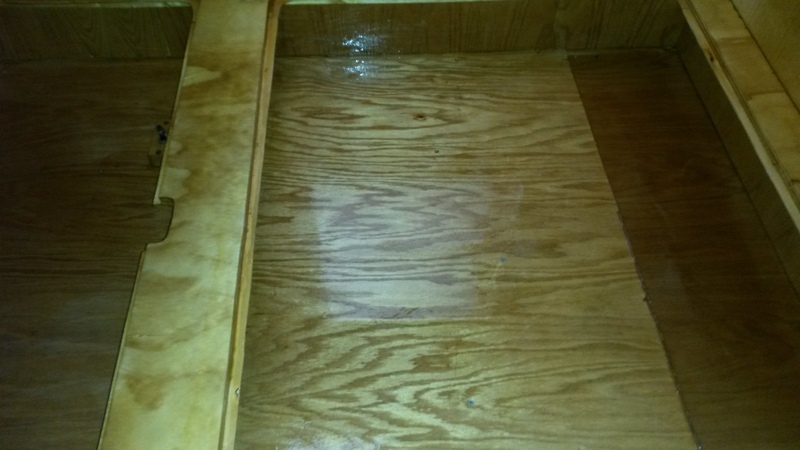 Also I did not want drips of stain here and there while trying to stain the inside. 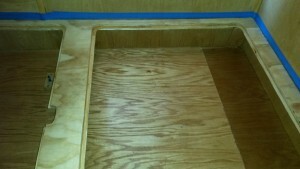 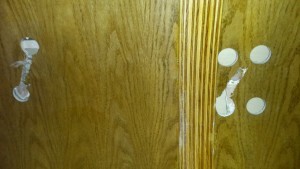 I then stained the inside with a much lighter color then the outside still using water base stain. Here is the galley fully stained. 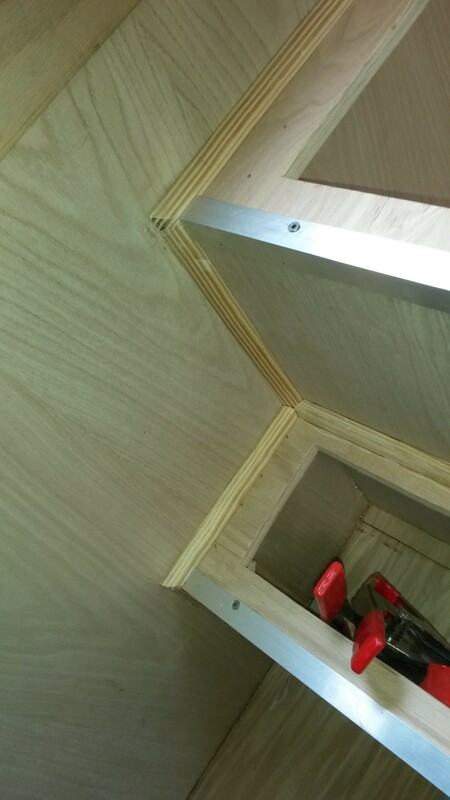 Same procedure nice small areas at a time. Hitting every nook and cranny was a little difficult but I worked from top down to ensure i did not rub against it as I did the work. 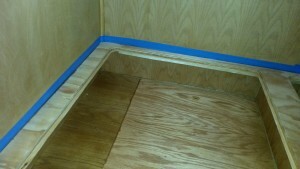 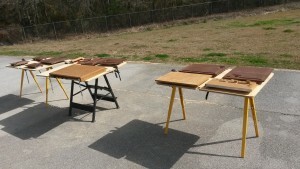 After all the staining was complete it was time to start putting on the protective coatings. 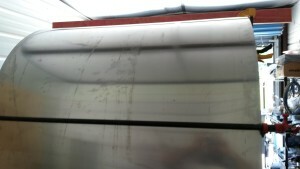 First I lightly sanded and cleaned the roof. 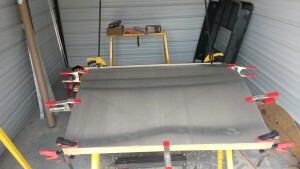 Then first coating I put on was just for the roof since it was going to get covered in aluminum later. 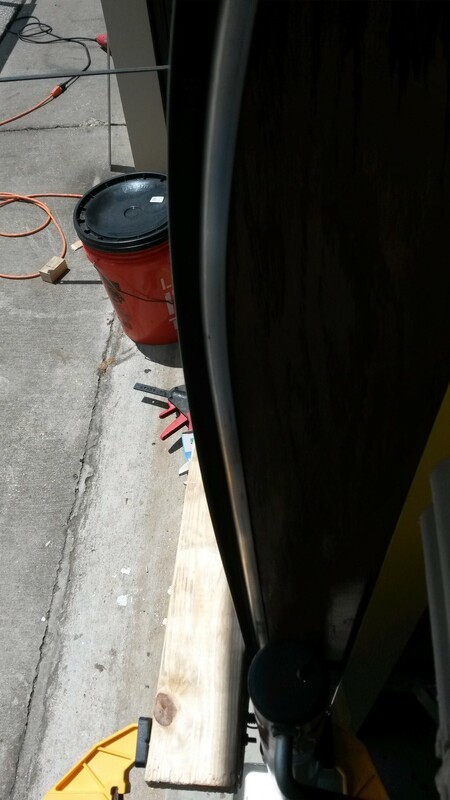 I went with a CPES epoxy. 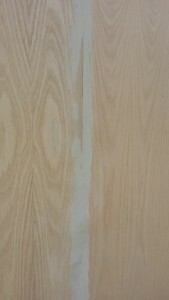 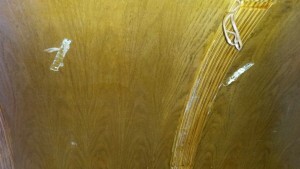 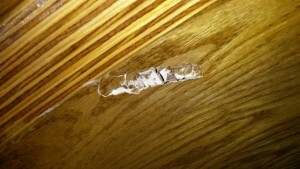 This is ultra thin epoxy that soaks into the wood and cures preventing the wood from rotting later. 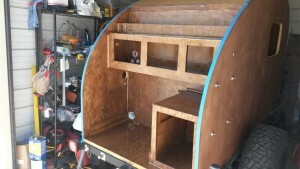 This is some great stuff. 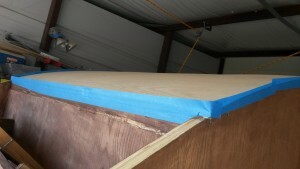 I taped off the whole perimeter of the roof with painters tape and made sure it was pressed on tight. 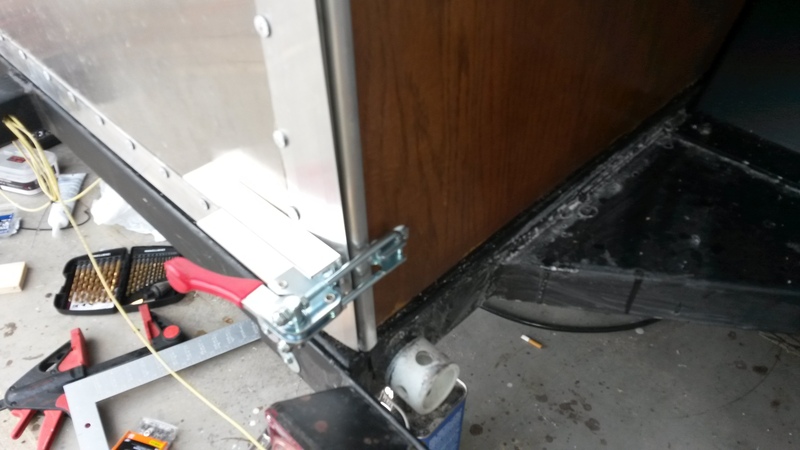 I did not want any CPES dripping down the sides. 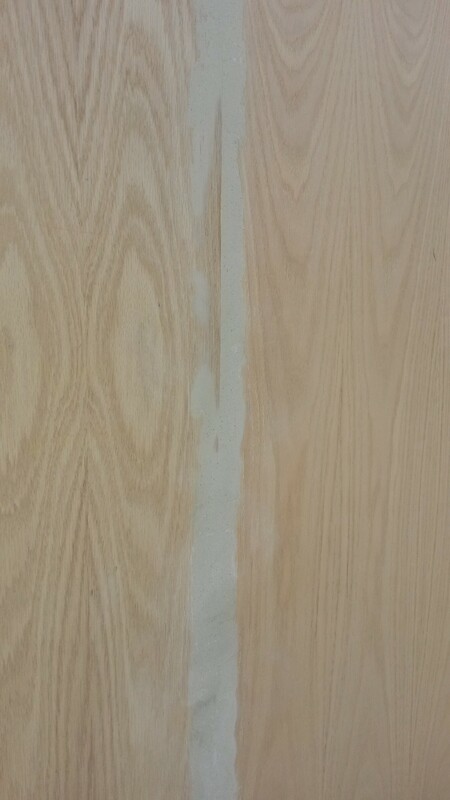 I ended up putting on only one coat but I put it on nice and thick as to completely soak the wood in it. 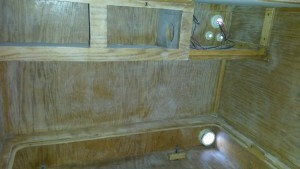 I then went on and CPES the whole interior floor area. 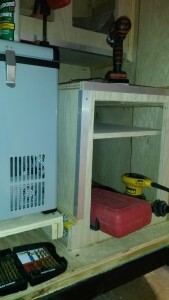 This area will house a water tank and other longer termed stored things. 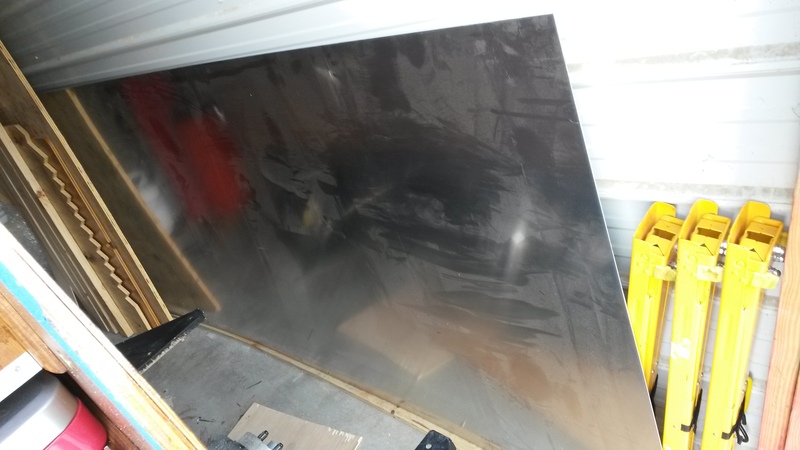 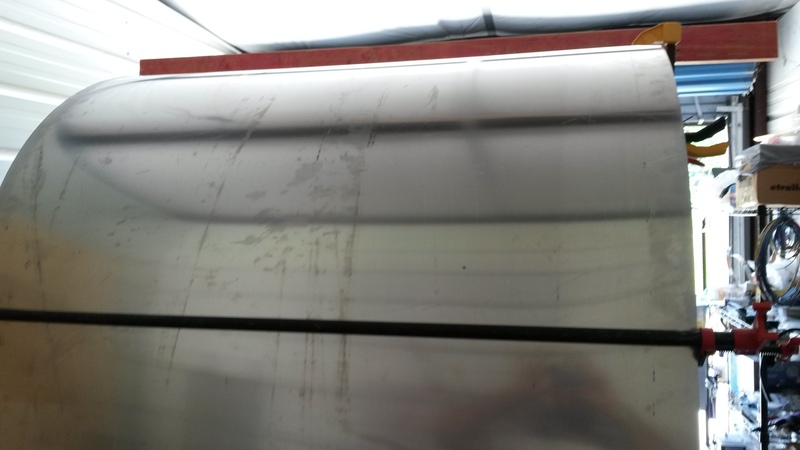 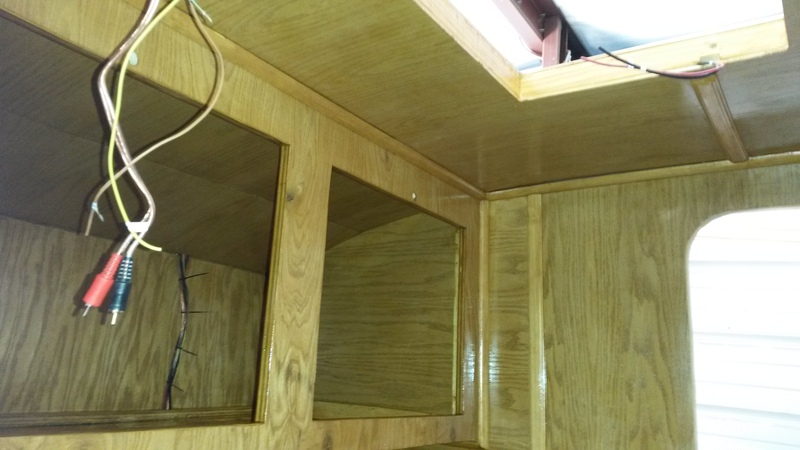 I wanted to make sure it was water proof where if the water tank started leaking it would train out the bulk head into the galley onto the ground and not soak into the wood causing damage. I also covered the false floor panels just to be safe. 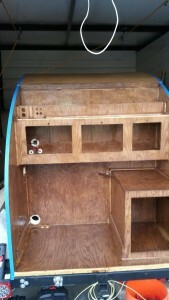 So for the inside i decided just to varnish it with a marine grade varnish. 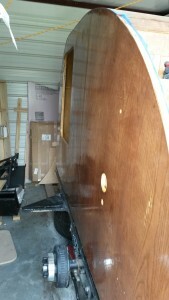 No epoxy needed. Varnish is tough and resilient. There will be no rocks flying inside hopefully. 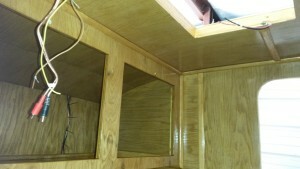 The varnish also provides great UV protection for the sun that does come through the window and door. 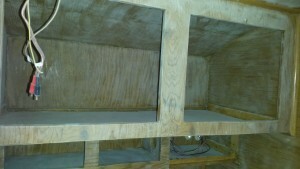 While the interior was taking its time drying. I went ahead and put the first coat on one side of all the cupboard doors. 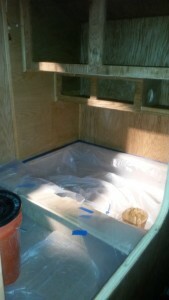 While that was drying I decided to finish up the day and do the first coat on the galley. Day 2, coat number 2 completed. 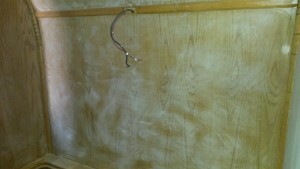 Day 3; Round three, Third coat. 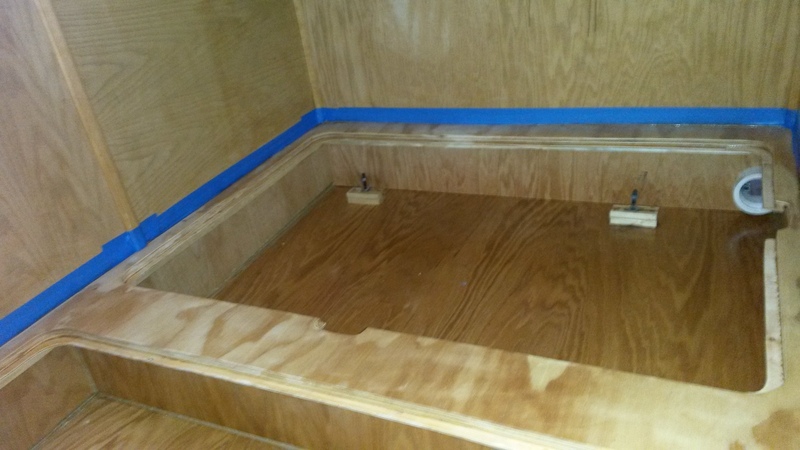 Now that I built up a fairly thick layer on everything and was not afraid of damaging the stain. 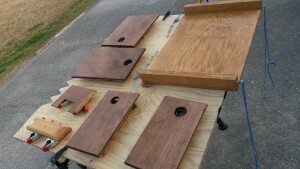 I lightly sanded down everything to ensure a nice clean smooth fourth and final coat. 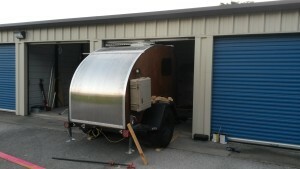 Now it was time to move onto the outside of the trailer. 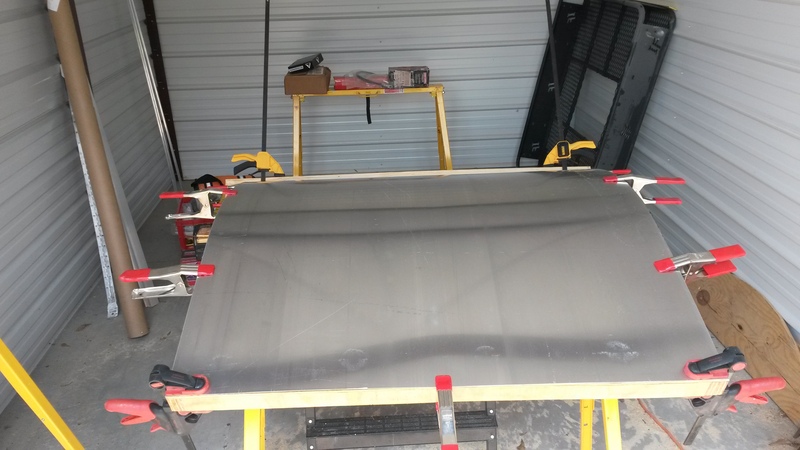 I was hoping to get the roof rack mocked mounted before I got started but the production on that is taking longer then expected. 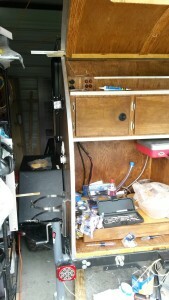 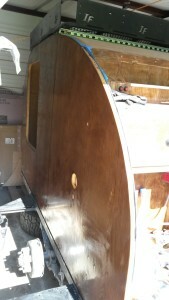 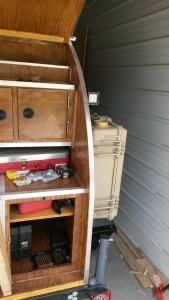 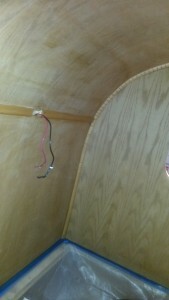 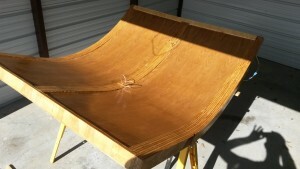 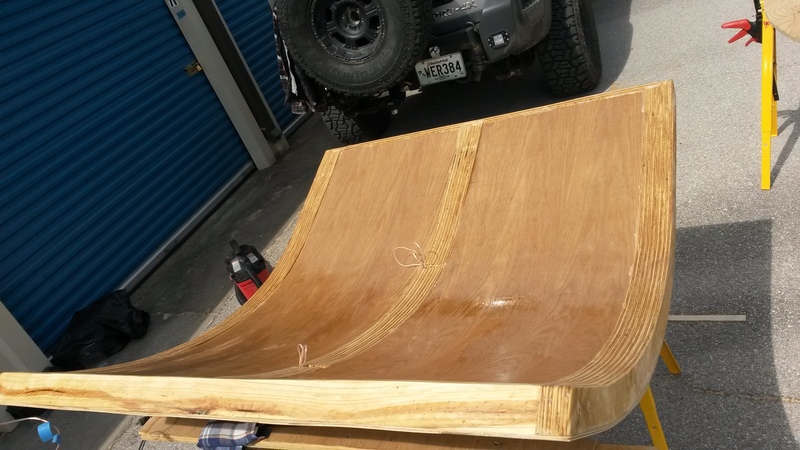 I first started off by cleaning the outside of the teardrop it been a while and pulled off a lot of dust and sawdust. 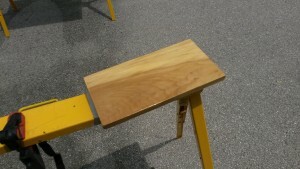 I then applied my first coat of epoxy on the outside. 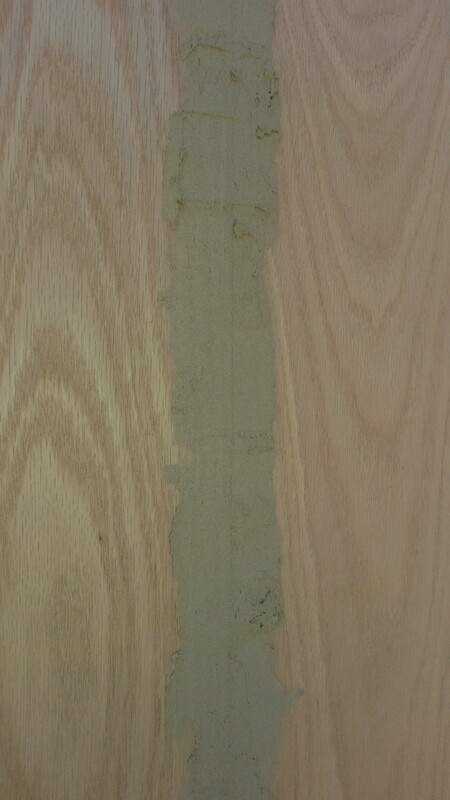 I made sure this was a nice thick one. I’m using marine grade epoxy with a special hardener to ensure a clear finish it also has some UV protection in it too. I then applied 2 more coats the following days on the side. 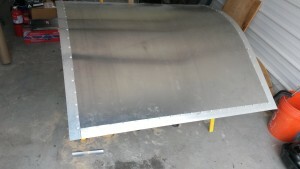 This built up a nice thick base coat. I wish I could of laid it flat to prevent runs and also so I could of done thicker and thinner coats. 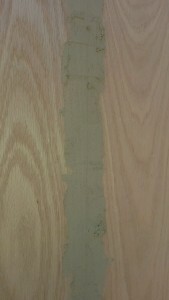 Since I had the thick base already on it and dried it was time to start sanding and smoothing out the coats. 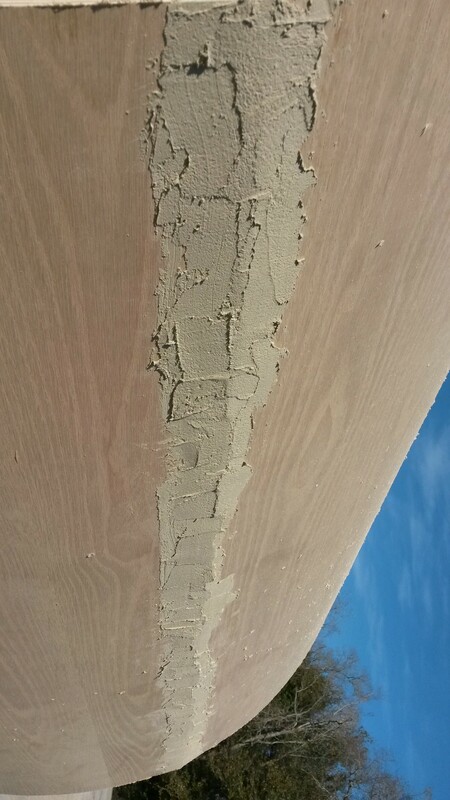 i sanded down as much as I felt comfortable. 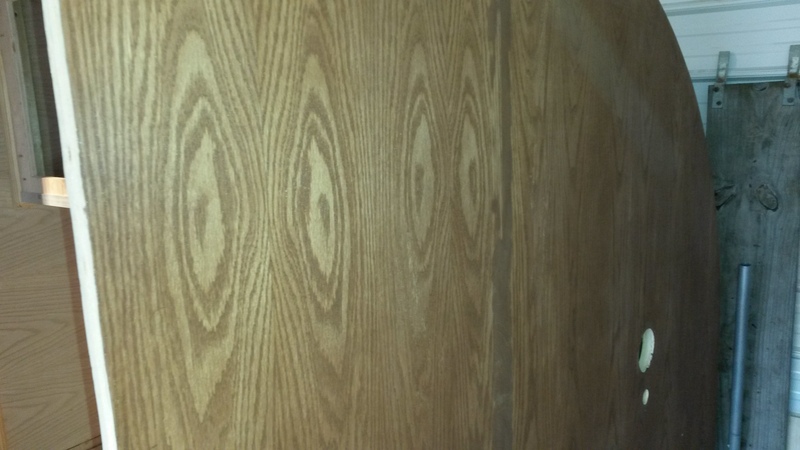 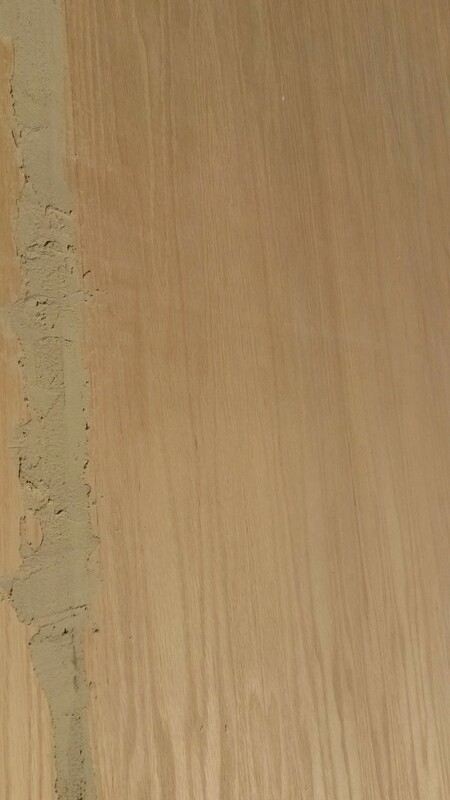 220 grit sand paper and the orbital sander on low. 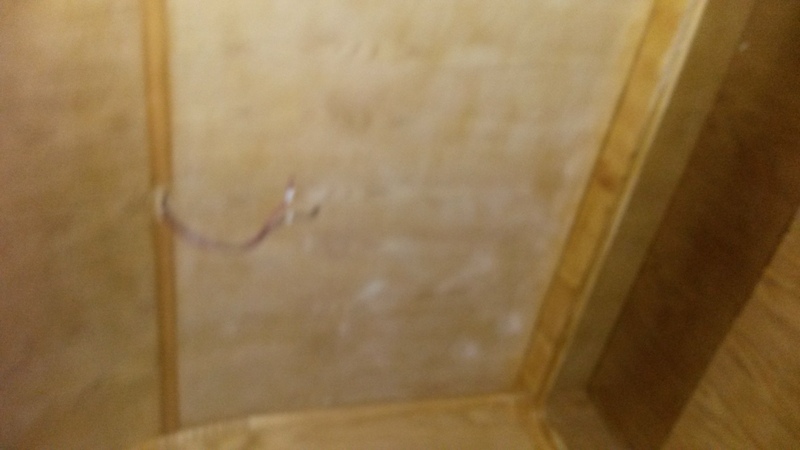 Take your time. 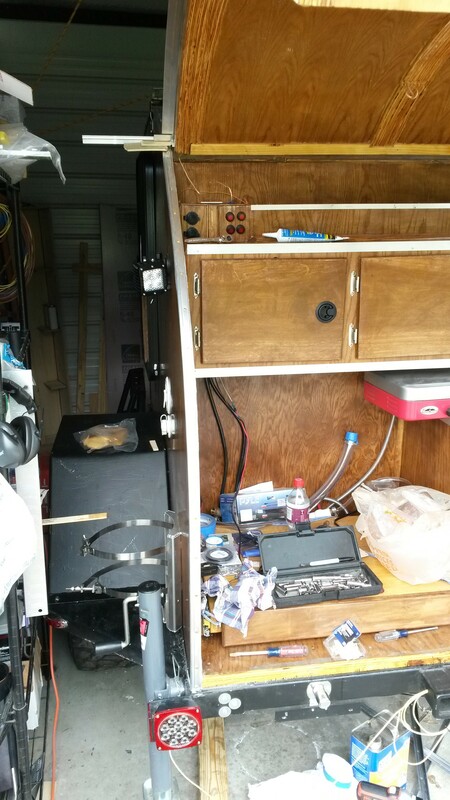 If you screw up here there is no fixing it now. 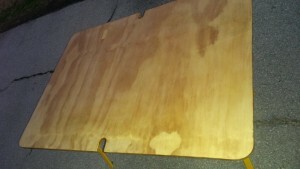 Then I applied another coat making sure this one is thin without any runs. 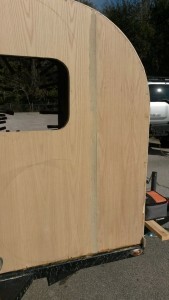 From here on out I will be going back and forth until I have a nice smooth finish I desire. 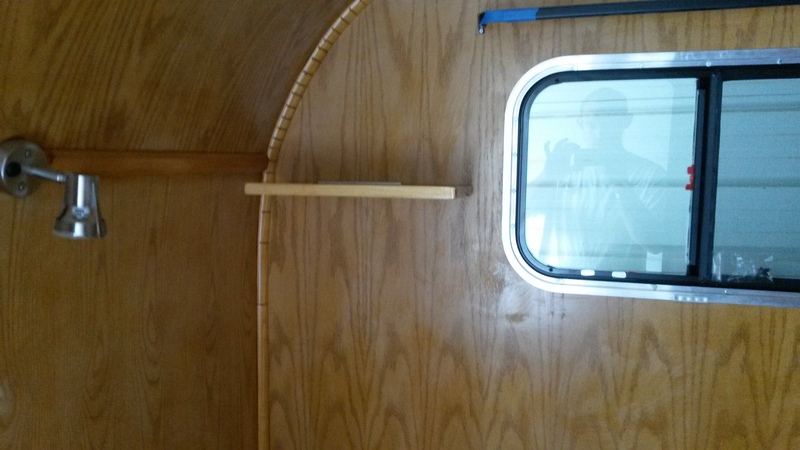 I then applied 3 coats of varnish over the exterior walls to finalize everything. I also am coating the inside of the hatch with a couple coats of epoxy to help protect it from the elements. I applied a couple of coats of varnish on the outside of the hatch cover. 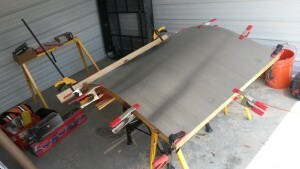 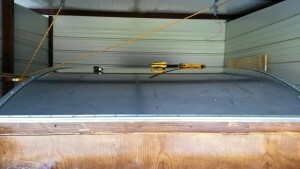 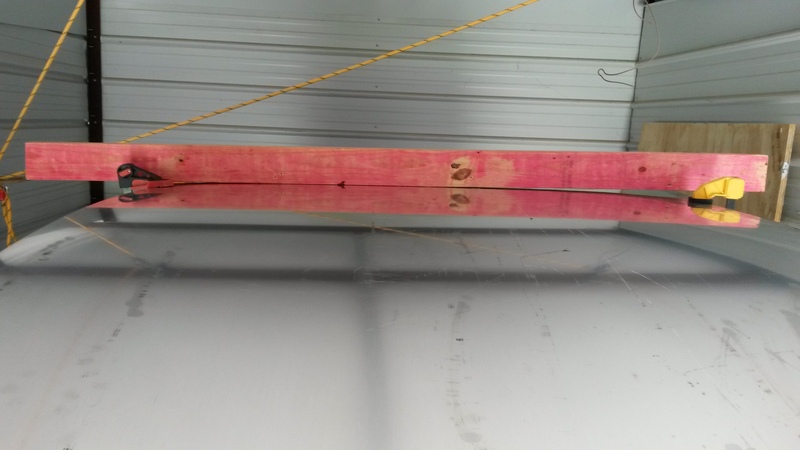 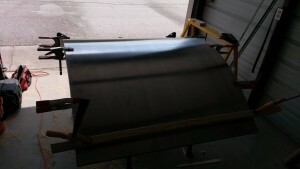 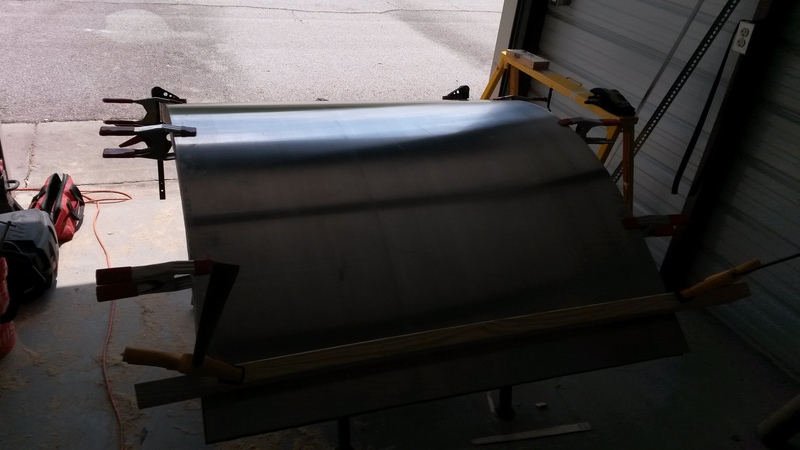 For the aluminum roof I got measured what I needed then ordered the piece pre-cut so I did not have to do it myself. 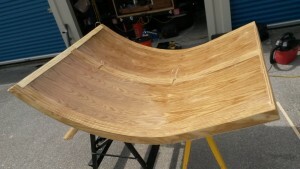 Which turned out perfect since I only had to trim up a small section. 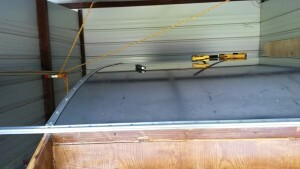 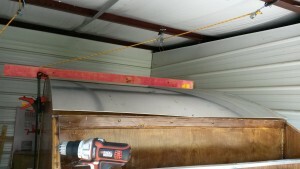 I then placed it on the roof and centered it and clamped it into place. 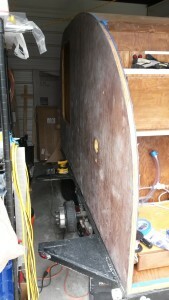 After everything was centered and in place. 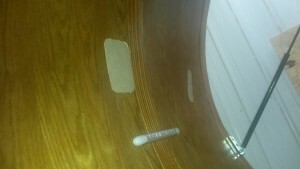 I applied butyl tape around the edges and started fastening the trim down. 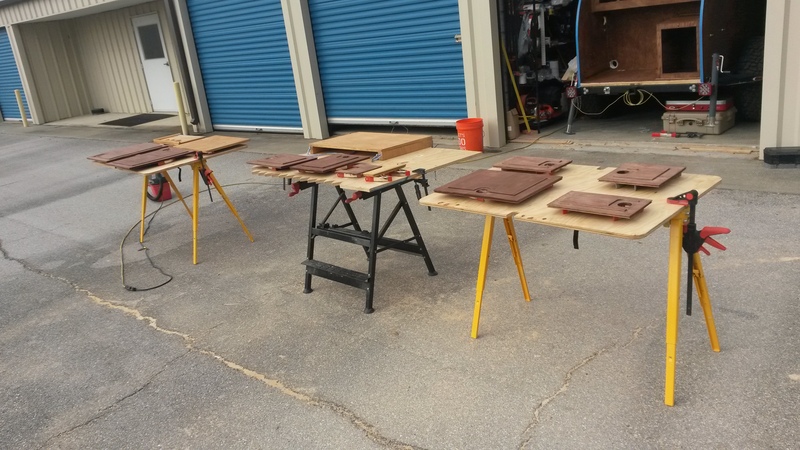 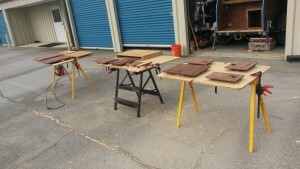 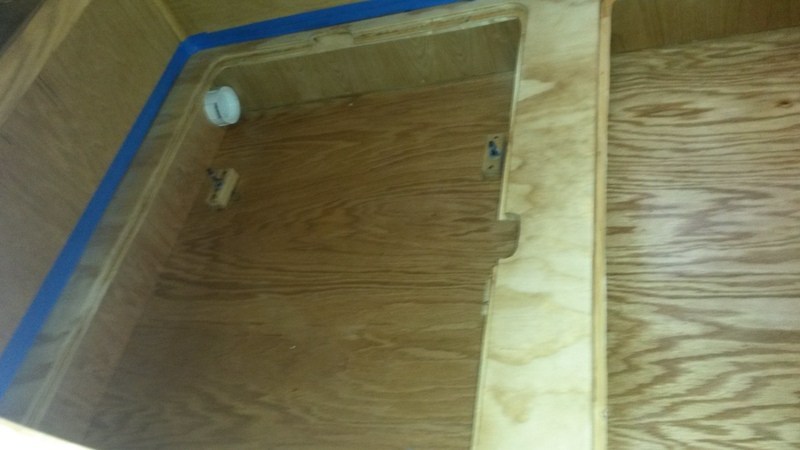 Now it was time to move onto the Galley Hatch Cover. 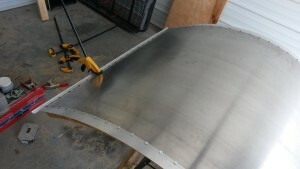 First was sizing up the aluminum that was pre-cut to size. Then I had to trim a little here and there to ensure a good fit. 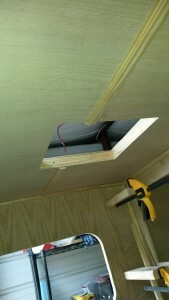 Then it was time to take the T molding and bend it around and fasten it to the hatch. 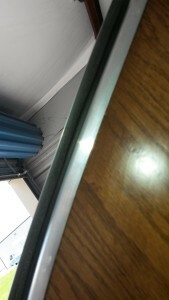 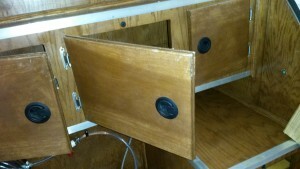 This molding would create the seal surfaces I needed to ensure the galley was water/dust proof. 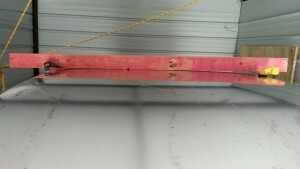 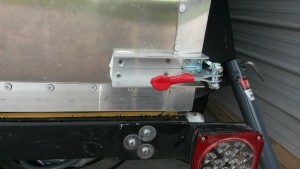 After securing all three sides with the T molding it was time to fast the hurricane hinge. 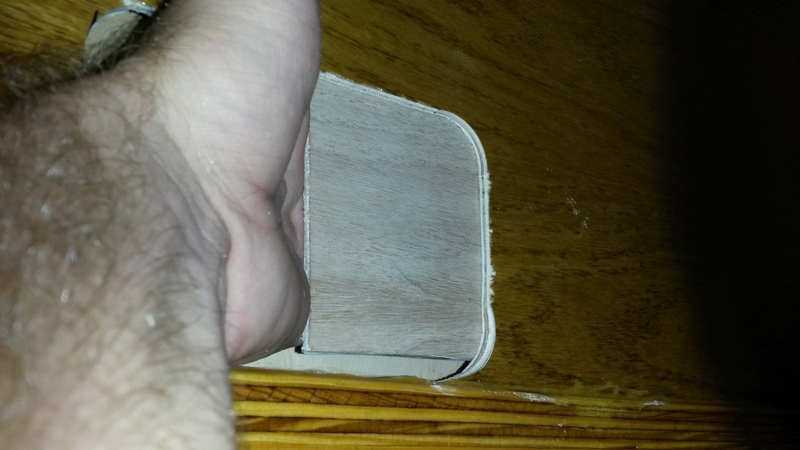 I don’t know how most people do this part. 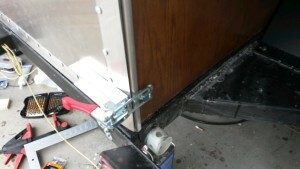 But I decided to fasten each part of the hinge to there separate peaces then slide the hatch onto the Teardrop body. 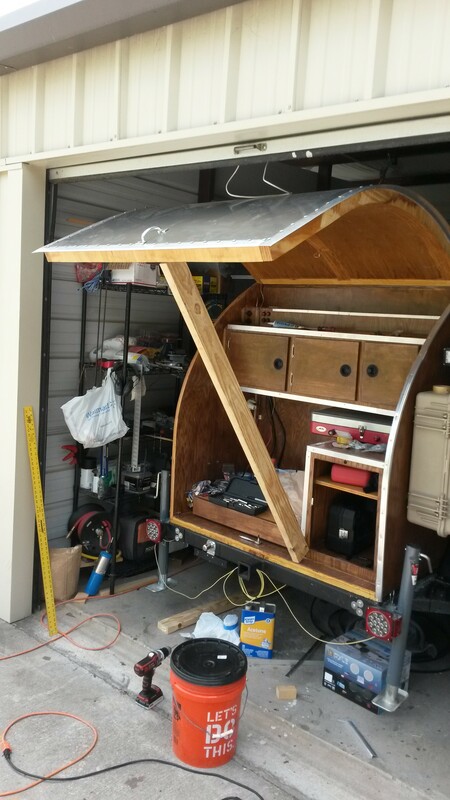 I knew this would be difficult but I did not see a good way to fasten the hinge to ensure a snug fit to the hatch while it rested on the teardrop. 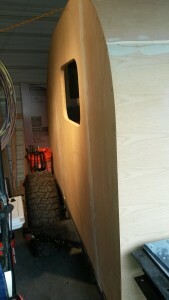 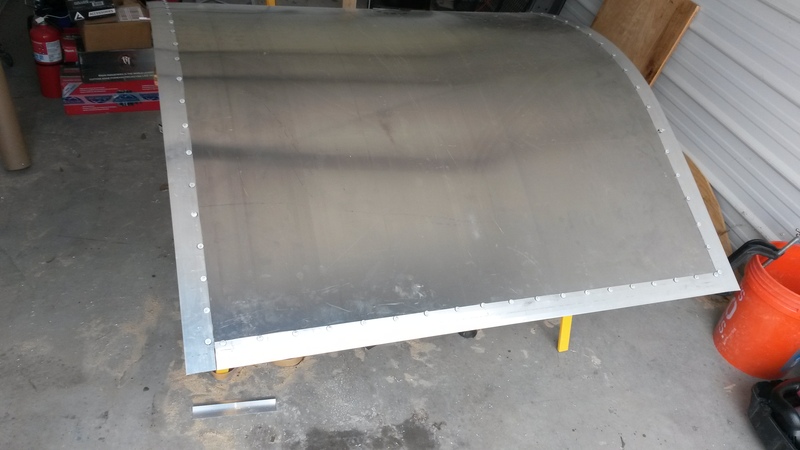 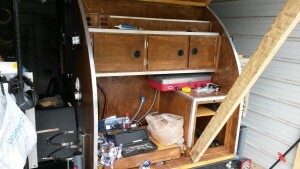 Here is the Hatch all mounted up onto the body of the teardrop. Now it was time to work on the sealing surface for the Galley. 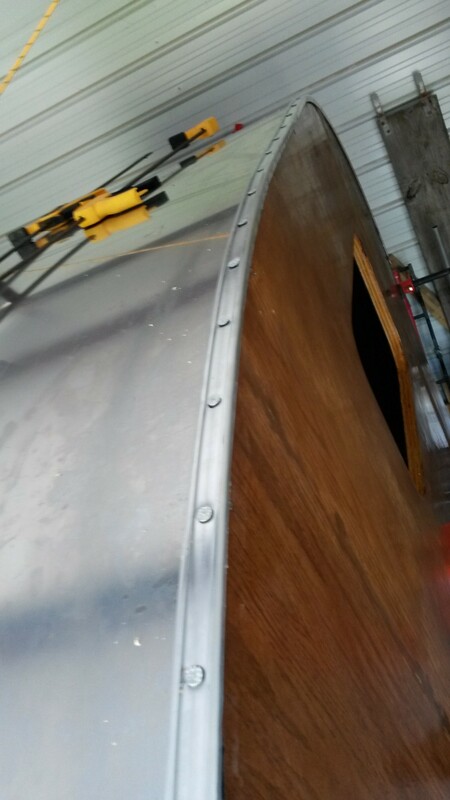 Here is the trim being mounted around the edge. 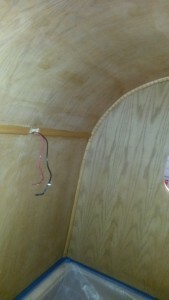 It is a L shape trim that I used. After the trim was all installed I then moved onto adding the seal for the galley. 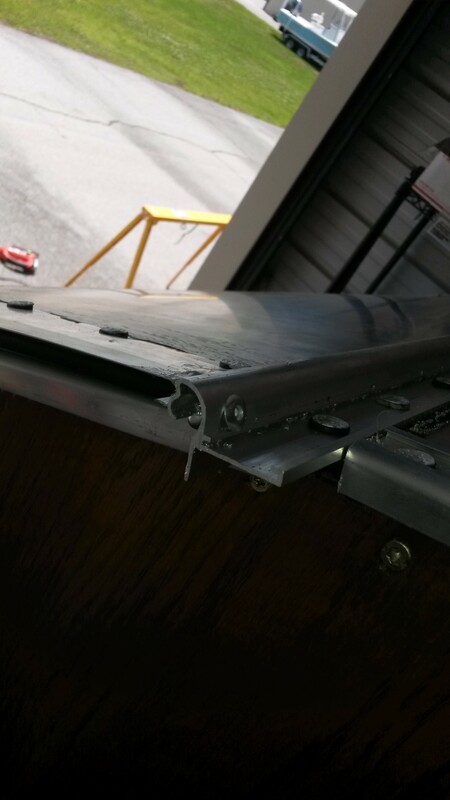 Due to the size of the gap that was left. 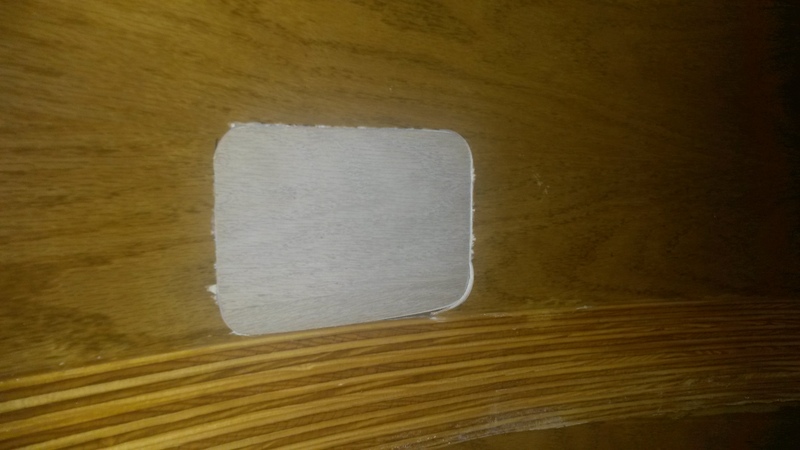 I decided to go with a duel seal. 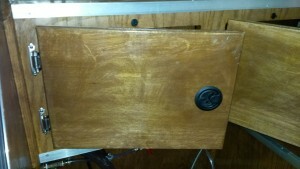 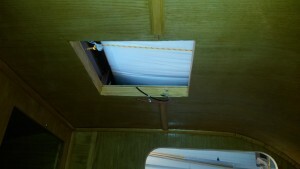 One mounted to the T trim on the Hatch cover. 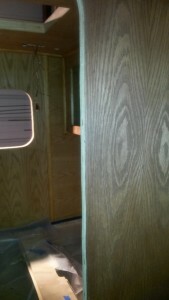 The other to the edge of the galley wall. These seals would press against each other to ensure a dirt/water tight seal. 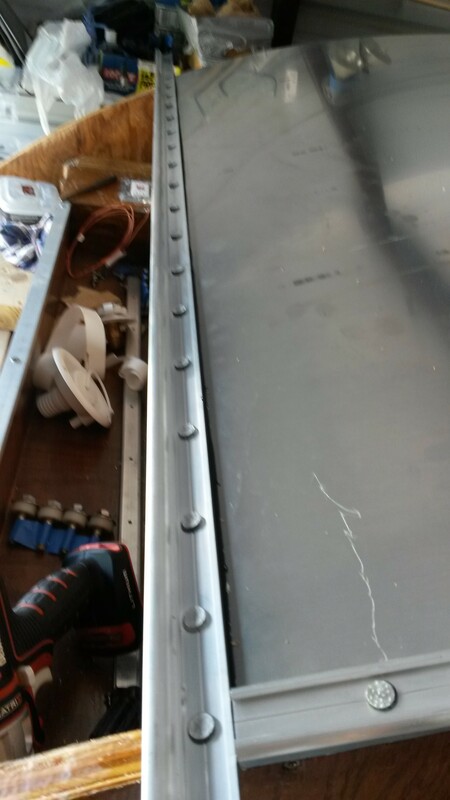 To ensure that the galley hatch would not wiggle one way or the other making it rub the wall I placed a rivet into each end of the hurricane hinge. 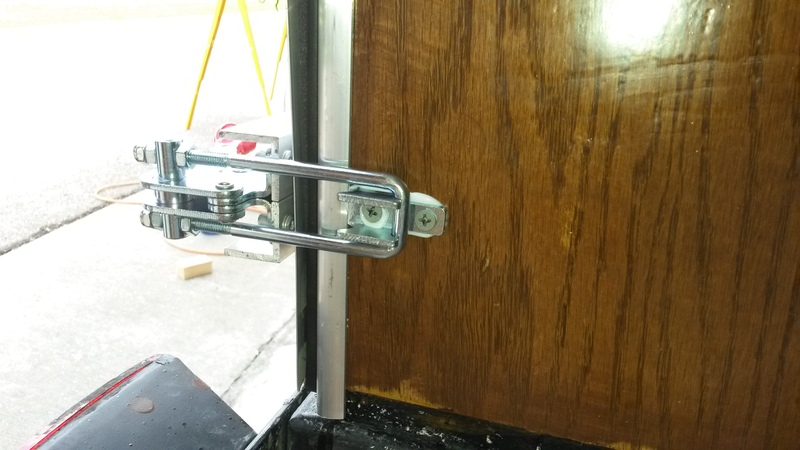 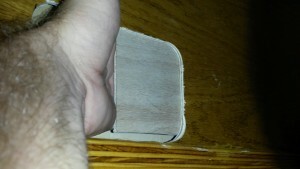 Ensuring the hinge could still function. I then needed to figure out how to latch my galley lid close. 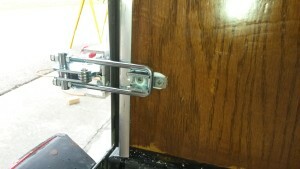 I first tried a downward latch. 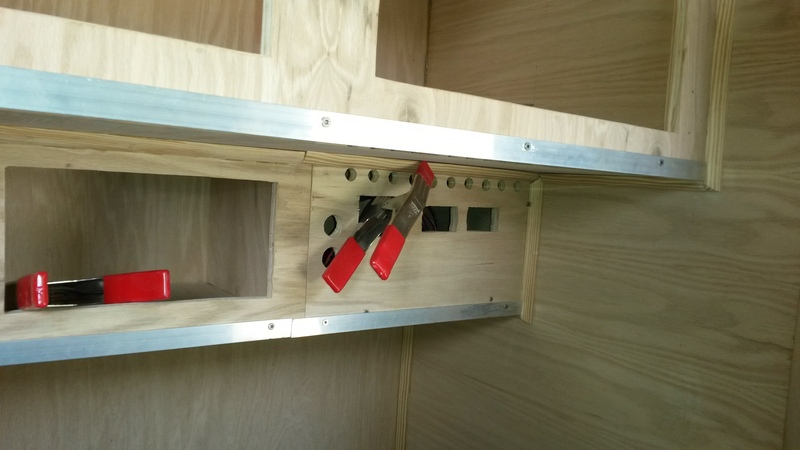 But this did not create a tight enough seal for the galley since the frame is sticking out slightly further then the galley lid. 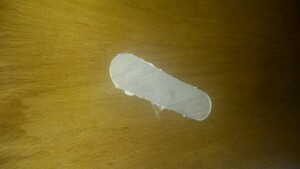 Then I came up with this idea. 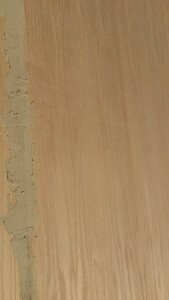 I know it does not look the best. 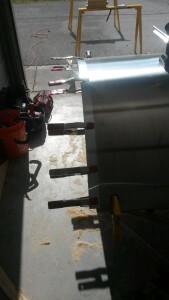 But with the angle iron reinforcement I could ensure the aluminium would not bend. 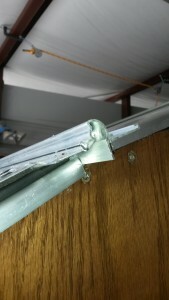 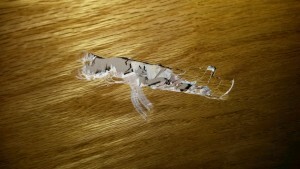 Along with this it gave me a place to secure the latch to prevent it from opening going down the road. For the front of the teardrop there was a gap where water and dirt could get under the aluminum shell. 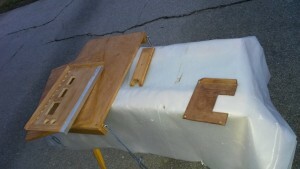 So I created a this molding peace that attached both to the body and frame. 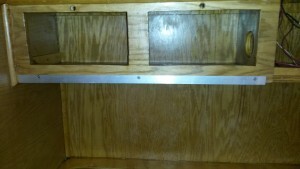 To give me a place to set my water bottle and glasses while I sleep I built a small removable shelf. 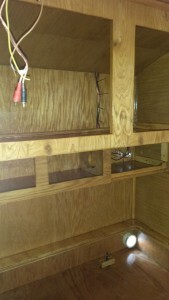 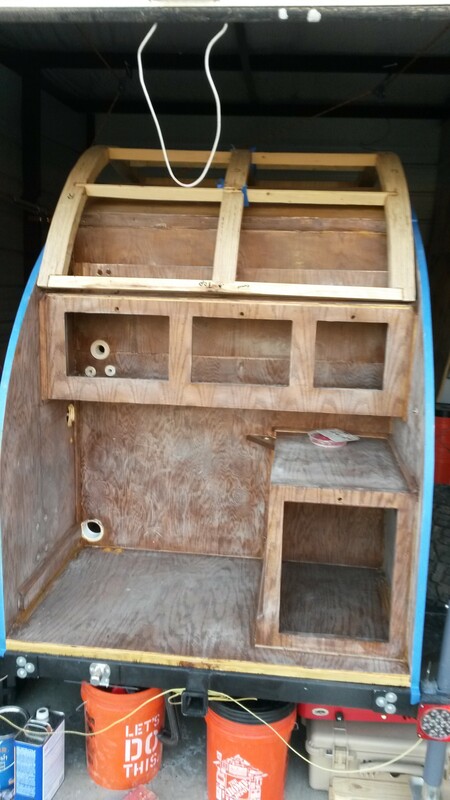 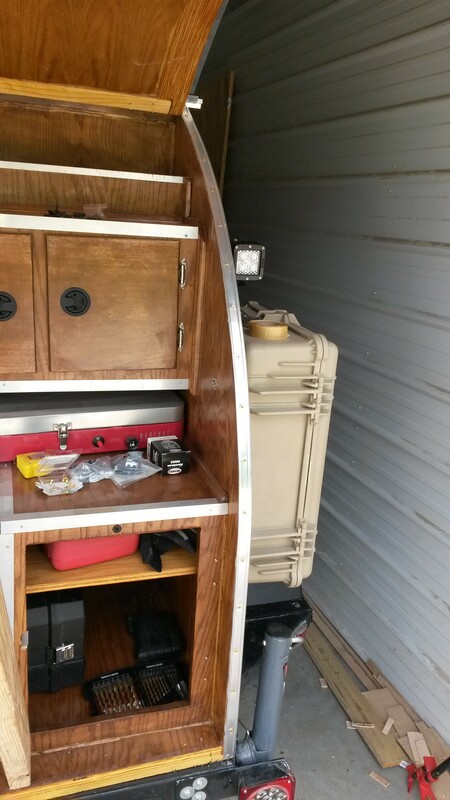 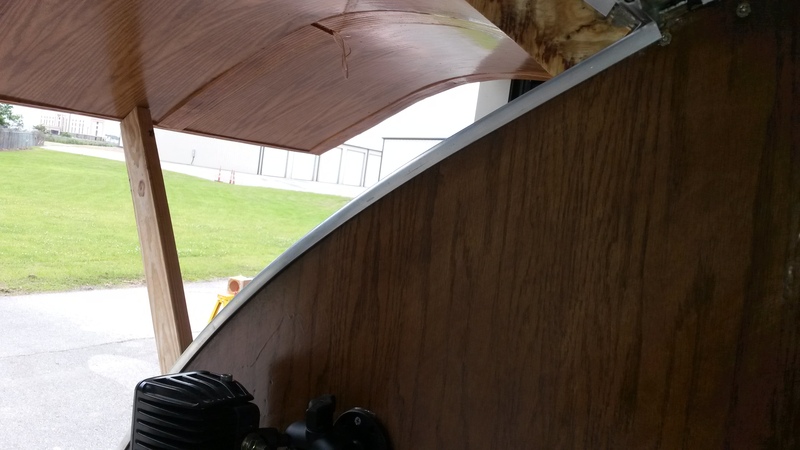 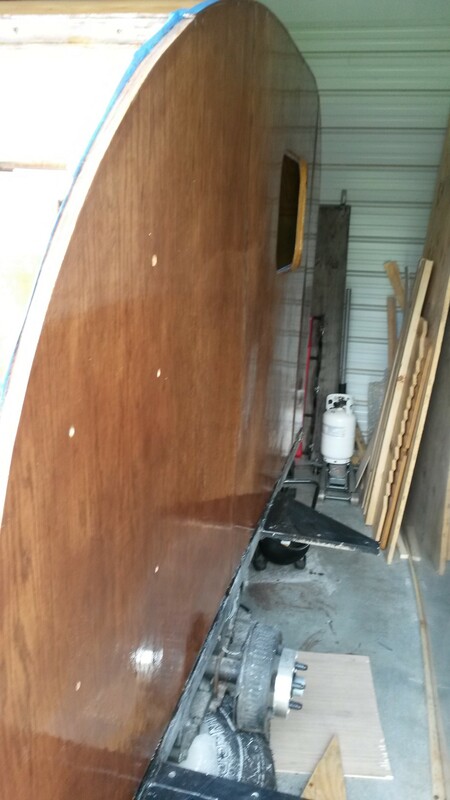 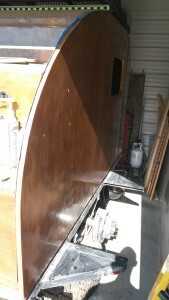 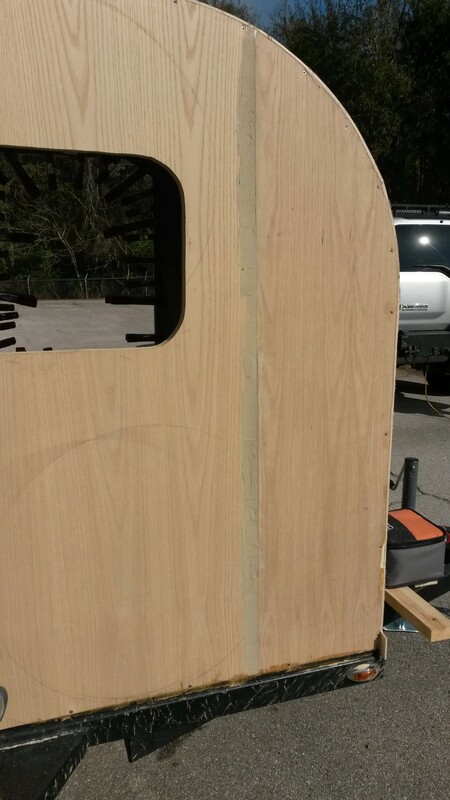 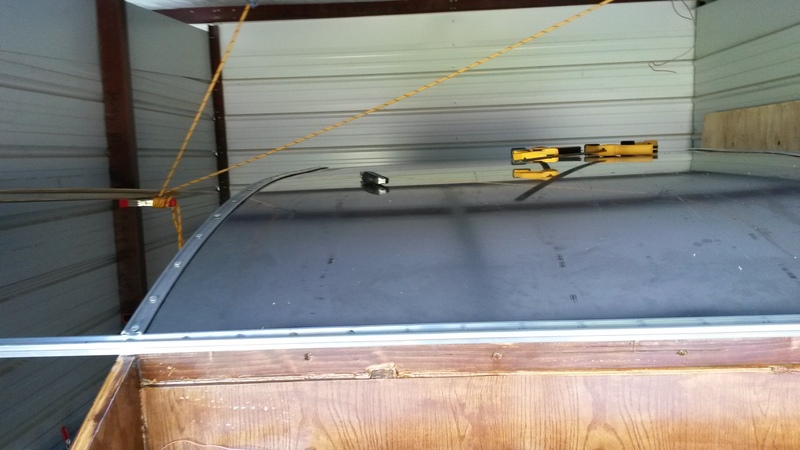 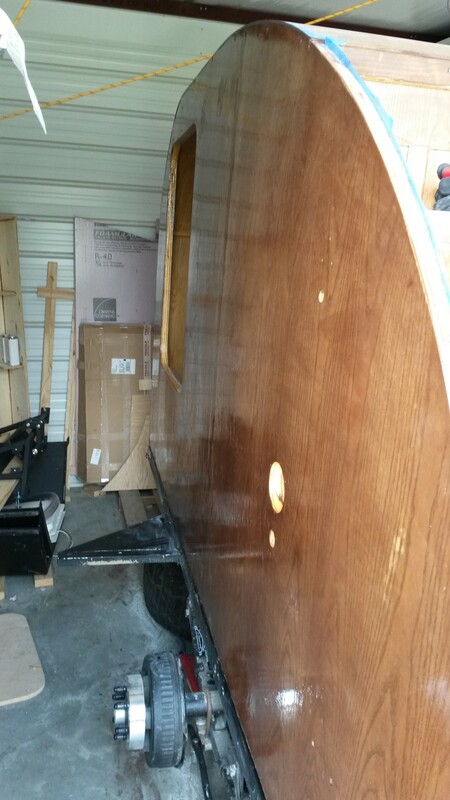 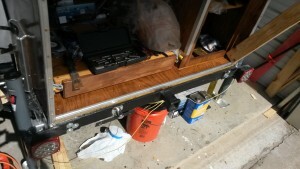 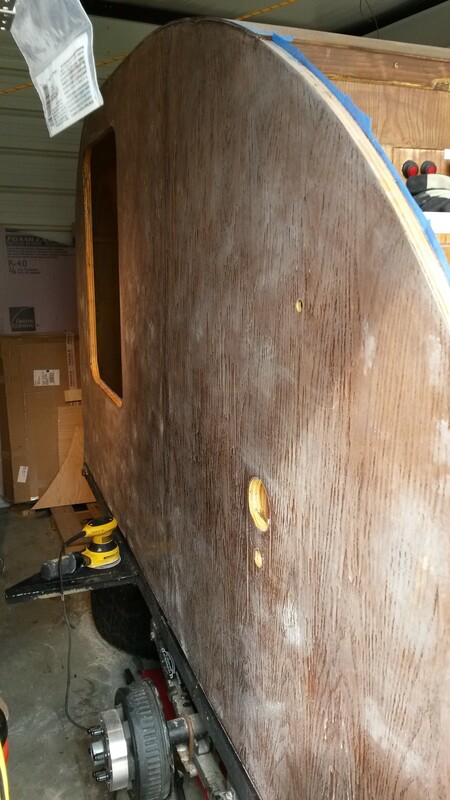 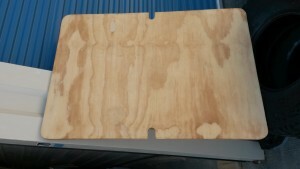 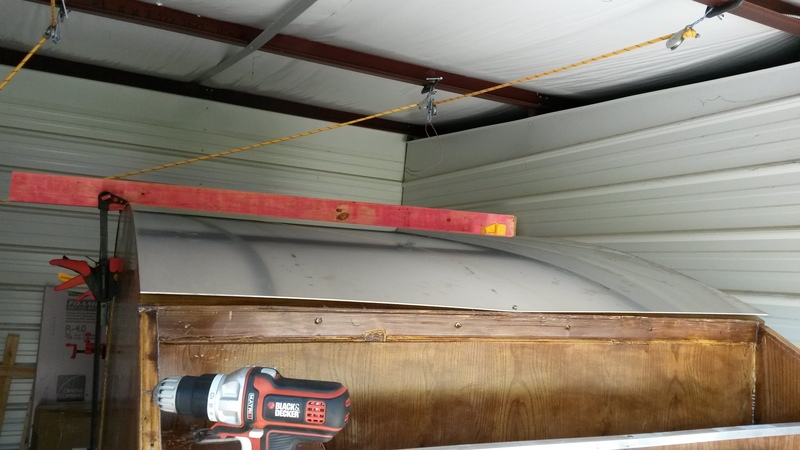 So while working on the teardrop the galley hatch was propped open with a 2×4. 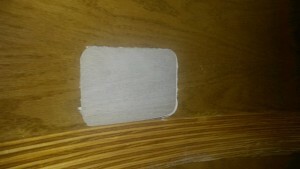 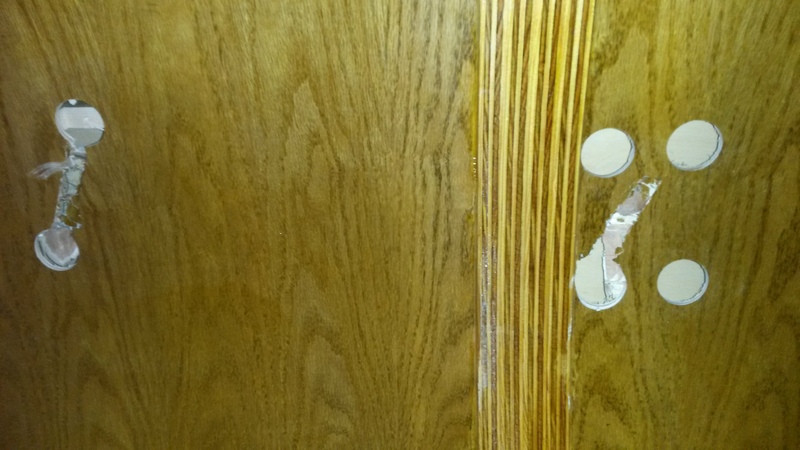 Well I guess the board came loose… The galley door slammed shut. The bad part was the cabinet doors were left open when this happened. 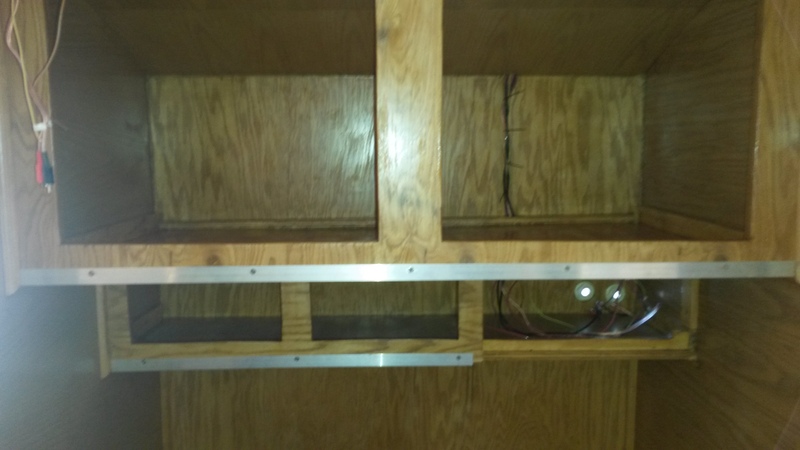 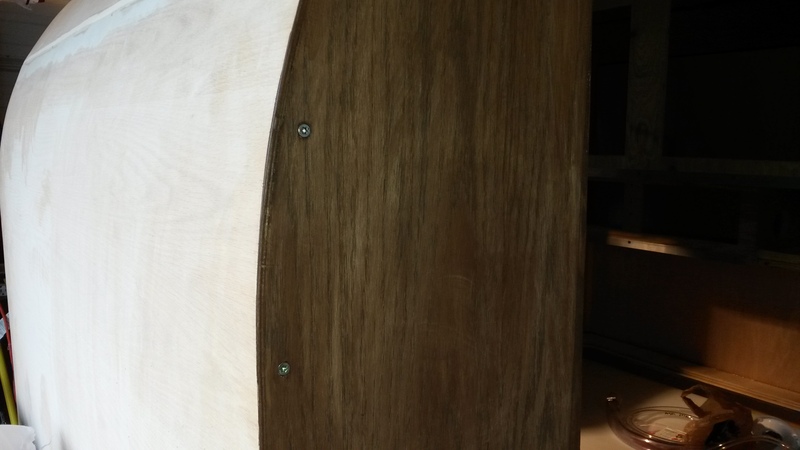 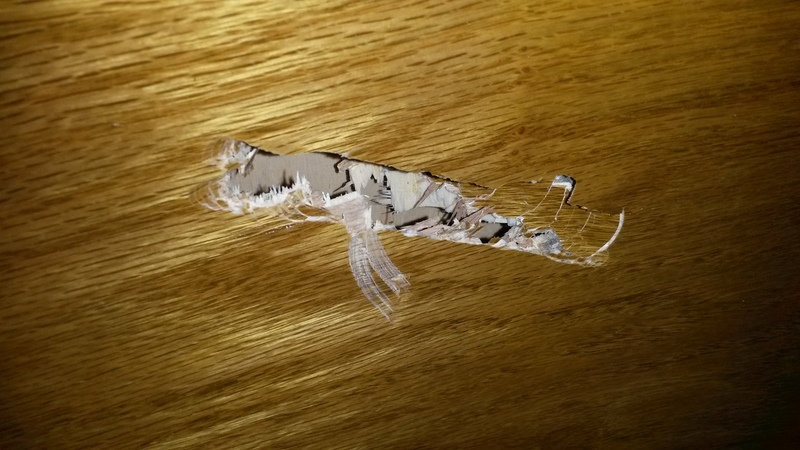 Here are the results of the cabinet doors going through the interior panel on the galley door and bent the hinges on the cabinet doors. 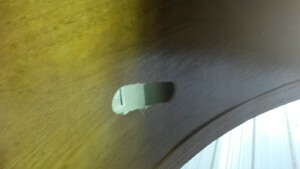 To temporarily repair this screw up I decided to clean up the holes to a shape I can mimic and spot repair until I can remove the door and replace the whole panel. 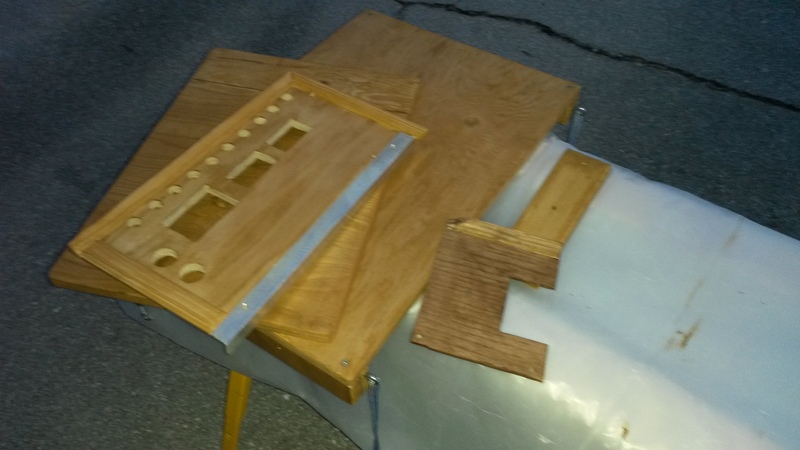 I used a hole saw and drilled holes at the end of each damaged section. 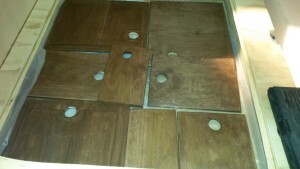 Then connected them with a jigsaw. I then glued a peace of plywood to the backside of the panel so I can install a peace on on the level surface with everything else. I trimmed down and fitted a single peace of plywood into each to help match it. 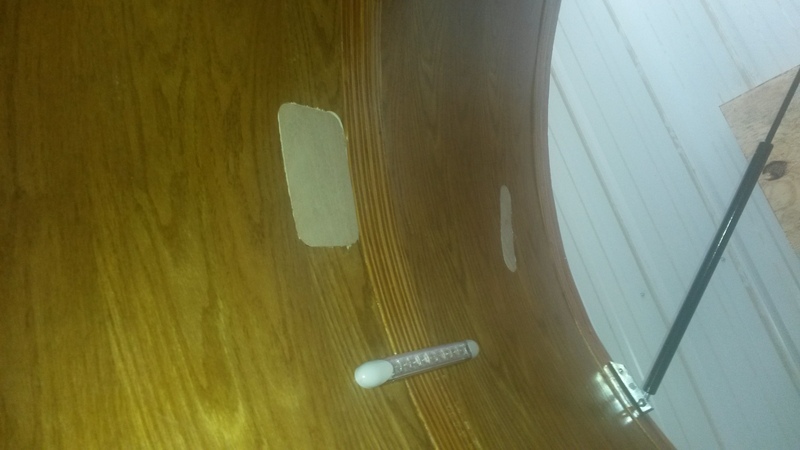 And glued it into place.